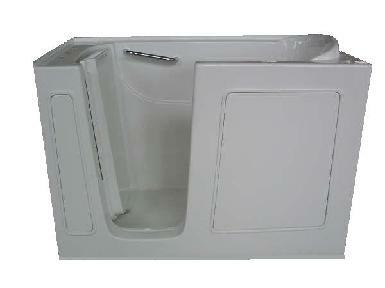 We offer three versions of the very popular walk in tubs. These are very economical conversions for seniors, handicapped individuals or anyone who has mobility problems. All Bright Tubs makes getting a walk in tub an easy process. We have licensed professional plumbers and electricians on staff who do all the work. The installation of your walk in tub will be easy, fast, and worry free. You will save thousands off retail price. All the walk in tubs are rich in fabulous features. One very popular feature that is included is the relaxing and therapeutic full hydrotherapy spa system. Each of the individual jets offers beneficial warm hydrotherapy to surround and massage your entire body. This helps to improve blood flow, reduce aches and pains, relax muscle tension, and soothe every inch of the body. 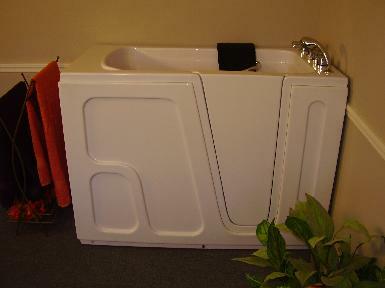 Other features include the whirlpool massage system, and the inline heater for keeping the water warm and comfortable. "Cascade" is 52 inches by 27 inches and fits into tight places where space is limited. "Waterfall" is 58 inches by 30 inches and fits into the space where a tradtional bathtub would normally go. Right or Left Mounted Doors - Inward opening for Safety. Lifetime Manufacture's Warranty on the Door and the Door Seal. One-Inch Steel Reinforced, Rustproof frame. Extra Wide Door with Convenient Knee Cutaway for Easy Opening and Closing. Hydrotherapy spa system with air jets that create therapeutic bubbles in treating arithritis, rheumatism, back pain, neck pain, improved circulation, injuries, and many other conditions. In Line Heater for keeping the water warm.